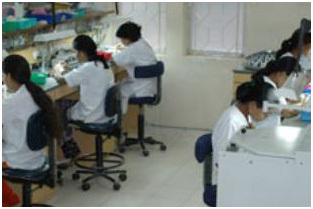 World-Dent also boasts of having our very own, in-house dental laboratory that is renowned not only as the best in India but caters to work from dentists worldwide. The lab is equipped with a highly sophisticated, technologically advanced PROCERA Nobel Biocare dental CAD/CAM (Computer Assisted Design; Computer Assisted Manufacture)scanner that scans the impressions the dentist makes, sends the scanned image via internet modem to Gothenburg, Sweden. Sweden receives this information and the computers manufacture an exact replica of the tooth core in Zirconia/EMAX and it comes back via UPS to the dental laboratory in Mumbai within 5-7 working days and this precise and accurate fitting core with the overlying porcelain(PROCERA Crown/Bridge)gets cemented in your mouth. So your crown is practically no even touched by human hand, ensuring that there is no margin for error. Now that's cutting-edge technology, isn't it?! There is a separate section of the laboratory that focuses & deals with the fabrication of your implant restorations and implant supported crowns and bridges. The passive and accurate fit of your implant restorations is of paramount importance in their success. CAD/CAM manufactured Implant supported hybrid restorations, Zirconia Crowns and Bridges etc. Equipped with a staff of skilled technicians, working under the vigilant and able guidance of our master technician Mr. DaneshVazifdar, we get the most beautiful looking restorations with precise and accurate fit, be it your Crowns, Veneers, Implant Crowns and Bridges to last you a lifetime. This way, an excellent relationship is forged between our dental technician, our patients and ourselves which finally reflects in the spectacular outcome of your new smile.